We’d love your help. Let us know what’s wrong with this preview of Protogenesis by Alysia Helming. The Greek Mafia may be involved. Vivid dreams of ancient deities consume her sleep. A maze of clues leads her to believe that her mother is still alive... She must go to Greece. The answers to her perilous quest lie there, as Helene braves into the unknown of a new life, torn between two Greek guys and a new world that literally awaits her. And who knows, maybe the Greek gods and goddesses are on her side... or maybe not. After all, nothing is as it seems. To ask other readers questions about Protogenesis, please sign up. Well, I broke my read 30-35% of a book before deciding to DNF. I’m sorry but this is just YA trash (and not the good kind). Now that I've had time to calm down some and sort out my thoughts I think I can write this review without too much ranting. But to sum up Alysia Helming's Protogenesis in short I would say it is painful. The writing, characters, plot, and everything else feel like a YA trope. I almost wondered at one point if she was making fun of the genre it was so cliche. - Ever is not a name. It is a word. It is incredibly awkward to read things like "Ever carried her bag". In fact when our gal first meets him I had to read the paragraph twice to make sure I read correctly that his name is Ever. It's a ridiculous name and (so far as I could tell) added no actual value, except to confuse readers. - All teenage boys are gorgeous. Apparently this is quite the world (even though it appears to be Earth in our time period...) that our gal lives in. Every teenage boy she encounters (and even some male adults) seem to be drop dead gorgeous! This chick is either in hormone overload (which I suppose is possible as she's a teen) or else Helming can't find a way to describe people that isn't with positive adjectives. - Coincidences galore. Our gal spends less than 12 hours in Greece (after flying from the USA), where she knows absolutely no one. She meets two people at the airport or during her travels in the first 12 hours. And somehow those EXACT two people just *happen* to attend the same school she attends? Really? But then the coincidences get worse... she happens to see a cats eye gem during her first 12 hours in Greece that seems to be important; and the next day at school in her geology class the teacher just so *happens* to talk about this gem? Where do I start with my complaints: geology is the study of rocks and earth not usually gems, what high school has geology class (isn't that just science class? ), and what are the chances that she learns about this rare gem on her first day at the new school? I hate coincidences that are painfully obvious. At least try to work the plot points into a cohesive and believable story please. - I've read this before. Based on the prologue and the quick dispatch of our gal to a new country, plus the details of the blurb on the back; this is just Percy Jackson for girls. I've already read that book thanks, no need to read a female version of it. On top of all that the writing is very cliche. It must include every YA trope ever (hey check it out, ever is a word not a name!) in the opening chapters, Helming has written a forced plot and nothing is shown to us, it's all told in a stilted, amateur way. I hate to be so harsh but honestly I could not find a single thing to take away from this book that I liked, or felt like I hadn't read a thousand times before. This book was so wonderful and interesting. I love Greek mythology and this story had my interest from beginning to end. The writing was great and I loved Helene. The Greek mythology and modern day time were interwoven beautifully and I really enjoyed this book. Thank you to NetGalley for my ARC in exchange for an honest review. I received a copy of this book from the publisher through NetGalley in exchange for an honest review. I had big hopes for this novel. The synopsis made me think of Percy Jackson and the organized crime aspect reminded me of the Arkadien trilogy by Kai Meyer. It could have been amazing, if it didn't focus on unnecessary details every page. There are many aspects to this overuse of details. There is the US-centric POV that the main character can simply not let go of. We get it, she's American (oo I received a copy of this book from the publisher through NetGalley in exchange for an honest review. There are many aspects to this overuse of details. There is the US-centric POV that the main character can simply not let go of. We get it, she's American (oops, sorry, Californian!) and has never set foot outside the continental US, we don't need to be reminded of it every other page. Within her first day in Greece, she manages to insult the inhabitants ("many local people seem to easily speak English so well" in an airport in Athens, having a hard time pronouncing the other characters' names but being angry when they can't get her own name right), make it all about the US ("the temperature, but it's in Celsius", which is what the entire world uses, apart from her country) and use the not-that-kind-of-girl trope ("not 'that girl' who fawns over guys"). As for that trope, she uses it constantly to explain everything about her that is different. Seriously, I thought we were over this kind of trope? I thought, in 2018, that we had established that bringing down other girls to pull yourself up is anti-feminist. In that same vein, she goes on about how hard it is to take the metro to get to school, how her clothes must have been purchased at Wal-Mart by Hal before she left, "this is not how any girl in her right mind would dress for the first day at a new school", and "who writes in chalk on a blackboard anymore". This book reeks of straight (I'll get to it in a second) white middle-class privilege. And of course, all of this is happening as she is supposed to search for her mother who might or might not be dead. This girl cannot keep her mind on the same subject for more than two seconds. She is like a crow with shiny objects. Onto the "straight" thing now. I can enjoy a good romance and it's almost inevitable that you will see romance in a novel. But this main character hits on EVERY GUY she meets. The author describes every Greek guy her character meets as a godlike being whom Helen drools on. Also, can Ever NOT be perfect? No person in the history of the world has been a top player in every sport, has played both basketball and volleyball AT THE SAME TIME as the best player, looks like a god, is rich but nice and approachable, etc. You can turn it down a bit and still have an interesting character that your MC could fall for. And, by the way, it would have been a much better story if she didn't fall for both him and Nick within their first 10min of encounter. Wow, I really did not know what I started with this book. It is so different and really refreshing. I loved the hidden rooms and dreams and Greek mythology. While it was a bit slow throughout the book, I liked the plot and I'm really looking forward to the next one in the series. Overall Helene Crawford has never really fit in anywhere. Awkward with a fascination with Greek mythology, Helene’s closest friend is her mother. But when Helene’s mother suddenly vanishes, Helene is whisked off to Greece to live with her godfather she never met. In Greece, Helene is desperate to unlock the secrets of her mother’s disappearance. But things are not what they seem. The Greek gods and goddesses from the myths Helene adores might actually be real, and one of them might want her dead. Overall, this was an exciting story of a teenage girl’s journey to Greece to find her mother while getting caught up in a love triangle. There’s Ever, mysterious, alluring, rich and handsome. Then there’s Nick, handsome, a tour guide, and a bit of a bad boy. Usually, I find love triangles annoying, but somehow I found myself rooting for both Nick and Ever. I assume that there will be more drama between Nick, Ever and Helene in the books to come. It will be interesting to see how this love triangle will progress. For those who are not too keen on young adult romance, rest assured, romance is not the only dimension of this book. Behind Helene’s mother’s disappearance, there is a world where the Greek gods and goddesses are real. I was expecting something along the lines of the Percy Jackson series, but Protogenesis takes a completely different path with parallel universes and secret relics, which I found interesting. There was also a considerable amount of world building that I hadn’t expected. Although I know only a basic amount of Greek mythology, it seemed as if the author did her research while writing Protogenesis. Unfortunately, the plot development is extremely slow paced and it takes a long time for any secret to be revealed. While I do love the mystery aspect of Protogenesis, it was just too slow to keep me fully entertained. Helene spends a lot of her time wandering around aimlessly before she stumbles upon anything substantial to advance the plot. I constantly found myself putting this book down because the story had become slightly stagnant. Although there is a lot of originality, the plotline seems to be imitating a young adult romance novel instead of carving out its own territory. Ever and Nick, Helene’s love interests, appear to be only two dimensional characters. They seemed to be only in the story for Helene to fall in love with. Sure, they each have their own backstories and history, but when they are with Helene, they turn into a carbon copy of a potential boyfriend material. 17 year old Helene Crawford is a California girl struggling to fit in with her peers, she lives with her mother and their hoard of cats. After a day at school like any other, Helen comes home to chaos, her mother is missing presumed dead and in the space of just a few hours, she goes from school girl to running for her life - the only person Helene can go to is a Godfather she has never met or even heard of before.......who lives in Greece. When Helene arrives she is swept up into a world of myt 17 year old Helene Crawford is a California girl struggling to fit in with her peers, she lives with her mother and their hoard of cats. After a day at school like any other, Helen comes home to chaos, her mother is missing presumed dead and in the space of just a few hours, she goes from school girl to running for her life - the only person Helene can go to is a Godfather she has never met or even heard of before.......who lives in Greece. When Helene arrives she is swept up into a world of myths and legends whilst trying to find out what really happened to her mother and balancing that with rebuilding her life in a new Country. There is a ton to love about Protogenesis and for the most part I didn't want to put it down. It's a fantastic adventure full of mysteries to be solved, hidden rooms, strange portals, Gods and Monsters. There is a seamless science fiction element woven into the mythology which I really enjoyed. Helene is a difficult character to pin down though, at times I really enjoyed her snark and her willingness to boldly jump into all sorts of situations to help her in her quest. But she is also incredibly ditsy and I often struggled to reconcile the fact that she was so easily distracted from her task of finding her mother. Granted, her search is hampered by her Godfathers insistence that she attend school but her all encompassing distraction by the "Greek boys and their eyes" gets a little tiresome and is one of my biggest pet peeves - what I did enjoy however is that the author herself has a little tongue in cheek dig at this, which was refreshing. I enjoyed the school element however, it really drove the plot forward and I liked seeing Helene being able to open herself up in way she never could in her old school, it brought balance to her life and I found this more believable than a 17 year old being allowed to run amok in a strange country on her own. I sometimes found it difficult to put an appropriate age bracket on this book and I'm mindful that I am not the target audience, in light of that I found it easy to forgive a lot of the angst and bratty elements but there was one paragraph that was filled with really bad language which was really out of tone and felt a bit forced. Recieved from Netgalley. As a lover of Greek and Egyptian mythology, I was really excited when I got this book. The beginning is brilliant, building a strong base and a beautiful world blending the Greek gods with the modern world. The plot itself continues to strengthen throughout the story and keeps you guessing. I like the idea and how well everything is co-ordinated. There were two issues I found with the story, which would’ve ruined it for me if the plot wasn’t so good. The first would be t Recieved from Netgalley. As a lover of Greek and Egyptian mythology, I was really excited when I got this book. The beginning is brilliant, building a strong base and a beautiful world blending the Greek gods with the modern world. The plot itself continues to strengthen throughout the story and keeps you guessing. I like the idea and how well everything is co-ordinated. There were two issues I found with the story, which would’ve ruined it for me if the plot wasn’t so good. The first would be the yelling/screaming that every character seems to be doing when they’re standing right next to each other. The second would be the love triangle and how the main character handles her problems. But she is a teenager and it is her first love, so there need to be mistakes etc etc. My favourite character was Bastet (if I’ve spelt that wrong my sister will kill me) I liked how she was basically the catalyst for everything. I hope to see more of her in the next book and I’m curious if she has a more human form. In the beginning I really liked Janus and his complete lack of parental skills. All in all it was a fun read and I will happily read the next one and probably the entire series. Oh and the cover artwork is beautiful. This book was a request from Netgalley. The synopsis for this one sounded really interesting, which is why I wanted to read it. The cover is also beautiful. The book is sort of "Percy Jackson-ish" and I really wanted to like it. I think this book has great potential. It's just that the chapters were a bit long winded in my opinion. To much Bach story, to much time spent on getting to know Vani. I just got very bored and had to push myself to read on which takes the enjoyment away. On the the plus s This book was a request from Netgalley. On the the plus side, I like Helene and Ever. The authors world building skills were good. This book is about Helene Crawford who loses her mom in the beginning of the book. Than she learns that there is a possibility that her mom is still alive, and that she has to look for her in Greece, where her godfather lives who she has never heard of before. As soon as she arives in Athene the adveture begins. She does her best to find her mom, while also going to a new school, meets new friends and potential boyfriends. I loved this story, it was a good mix between I enjoyed this book so much! I loved this story, it was a good mix between greek mythology and culture, fantasy and romance and mystery! I was given this book by Netgalley! Thank you! As a big fan of fantasy books related with mythology - Greek, Egyptian, I was pleased to find this book. Helene is a normal girl in an American school till the moment her mom has disappeared or she is even dead. Then Helene is sent to her godfather in Athens with risk for her life and no really clue what really is happening. Helene's mother is missing and someone is trying to kill her. She is told to trust no one as she makes her trek to Greece to stay with a Godfather named Janus she doesn't know while she tries to figure out what happened to her mother. Janus is an eccentric character who is as confused that she has arrived in Greece as she is that he and her mother were friends. With glowing stones, a magic cat, a and mirror that becomes a portal another planet while she tries to balance out her potential boyfrie Helene's mother is missing and someone is trying to kill her. She is told to trust no one as she makes her trek to Greece to stay with a Godfather named Janus she doesn't know while she tries to figure out what happened to her mother. Janus is an eccentric character who is as confused that she has arrived in Greece as she is that he and her mother were friends. With glowing stones, a magic cat, a and mirror that becomes a portal another planet while she tries to balance out her potential boyfriend's Ever and Nick and figure out the mystery surrounding her mother's disappearance Helene certainly has her work cut out for her. I would highly & strongly recommend Alysia Helming's "Protogenesis" novel to all the fellow readers who want to get immersed in an adventure where the lines between fiction and reality are so eloquently obscured that you can't tell in this story where the myths end and where everyday life begins! On this note, I also found the main storyline very innovative and it certainly gave me a new understanding of mythology! Helming's writing style is fresh and fast-paced, which I loved cause while rea I would highly & strongly recommend Alysia Helming's "Protogenesis" novel to all the fellow readers who want to get immersed in an adventure where the lines between fiction and reality are so eloquently obscured that you can't tell in this story where the myths end and where everyday life begins! On this note, I also found the main storyline very innovative and it certainly gave me a new understanding of mythology! Helming's writing style is fresh and fast-paced, which I loved cause while reading, it made me feel like I was watching a movie inside my own head! Thank you Netgalley for a copy in exchange for my honest review. I really wanted to like this one. I love Greek mythology and I love YA so I was eager to dig into this one. Unfortunately, the execution was quite poor. The writing style seemed juvenile, events were rushed and only half-explained, the relationships between characters were flat, and the main character wasn't likable. All around, it didn't seem like a well thought-out storyline and a lot of the dialogue made me cringe. "'Oh wow,' I s Thank you Netgalley for a copy in exchange for my honest review. "'Oh wow,' I say in awe of his intelligent mind. I knew that he was deep, but this is wholly unexpected." I loved reading Protogenesis. The mix of tragedy, adventure, Greek mythology, well developed characters and a little romance doesn't hurt, to make this a great read for all. I look forward to the next book in the series! I received this book on Netgalley in exchange for an honest review. When I went into this book I was hoping to be blown away, because the description was quite enticing but this book was soooo bad.First off the description pretty much sums up the whole book so if you want to read the book you've read it in the description. The relationships in this novel were so cringey, the love triangle was so badly put together because you can automatically tell who she is going to choose. Also the instalove i I received this book on Netgalley in exchange for an honest review. The relationships in this novel were so cringey, the love triangle was so badly put together because you can automatically tell who she is going to choose. Also the instalove is so real they're making love proclamations after barely knowing each other and it's just so cringey. Now to focus on the plot, the plot was sooo weird. Like the concept was cool, but the execution was awful and it just had me cringing and confused. Not only that but the protagonist is one of the most unlikeable, selfish, boring and one dimensional character I've ever read about. None of the characters in the book were well developed and everything was just so one dimensional. This is my come back to YA books. I used to read them a lot. I was not disappointed by this story, even with a lot of cliches from the genre. This story in few places seems a little too "distracted" by not important side-story things. Aside from that this was a greatly written and enjoyable story. I was not disappointed by this story, even with a lot of cliches from the genre. This story in few places seems a li This is my come back to YA books. I used to read them a lot. 100% Recommended! I loved how ancient Greek mythology & modern day technology are intertwined into such a captivating plot! What an incredible novel! A very interesting mix of young romance, real-world problems & Greek mythology! I was given a free copy of this book through NetGalley. This review is in no way is influenced by that factor. When Helene Crawford's mother seemingly dies in a fire at work, she's sent to live in Greece with an unknown godfather. Doubtful about her mother's death, Helene tries to search for answers while trying to assimilate to Greek culture and her new caretaker, the often unhinged Janus. I wanted to like this, I really did, but it just didn't work for me. The description sounded awesomely diff I was given a free copy of this book through NetGalley. This review is in no way is influenced by that factor. I wanted to like this, I really did, but it just didn't work for me. The description sounded awesomely different with a mix of fantasy, romance, and Greek mythology. Add beautiful cover art and I was exited to check Protogenesis out. Unfortunately, Greek mythology and a pretty cover were not enough to make me enjoy the story. The following points are totally spoiler-y, so avoid the rest of this review if you are going to even attempt to read this book. 1) The main character was changed from an average American girl to a typical Barbie doll. Helene first comes across as an average American teenager with faults. After a, ahem, trip, her sight is perfect, her complexion is flawless, she's a perfect fighter, she's skinnier, more toned, and tanned. Helene can also understand and speak fluent Greek. She was made into a freakin' Barbie, which she hated. 2) There were one too many love interests. Sure, there were only two, but she fawned over them more in the first week than anything else. Not only that, but it was a horrible version of insta-love that didn't make sense. In the end, I never truly cared about either love interest because I didn't know enough about either of them to give a damn. 3) The Time Factor aka I think the entire book takes place over four weeks, but Helene acts like she has been in Greece for a year. Girl, it was like one freakin' week. 4) Everyone yelled at one another instead of having a conversation. Holy crap on a cracker! Everyone yelled at everyone! Helene didn't agree with Janus, so she yelled! He was a raging wackado, so he yelled back! Helene didn't get what she wanted, so she'd yell! Arguments and tons of exclamation points over nothing instead of talking! I really, truly didn't care. While just shy of four hundred pages, it felt at least double in size. At halfway through I wanted to know what was going to happen, but contemplated not finishing. The love interest should have been done differently, the pacing should have been faster, and revelations came way too slowly. I have followed @alysiahelming_novelist for a while on IG, and was recently honored to be offered the chance to review her novel Protogenesis before its release on March 29, 2018. After following Helming's travels to Greece for research and meetings about this novel, I expected great things going into this book. I was not disappointed. Helena is a 17-year-old girl whose mother was killed in an explosion at her workplace. Or was she? Helena's search for answers leads her to Athens, Greece, where I have followed @alysiahelming_novelist for a while on IG, and was recently honored to be offered the chance to review her novel Protogenesis before its release on March 29, 2018. After following Helming's travels to Greece for research and meetings about this novel, I expected great things going into this book. I was not disappointed. Helena is a 17-year-old girl whose mother was killed in an explosion at her workplace. Or was she? Helena's search for answers leads her to Athens, Greece, where she becomes involved with a godfather she didn't know existed, a Greek underworld crime ring called the Syndicate, and two young men, both vying for her affections. Not to mention certain Greek gods who may be more than what the mythology books led her to believe. Young adult is not my genre of choice, but Helming had created so much more than a coming-of-age teen angst story. Take a thriller novel, throw in a little romance, add a pinch of Egyptian and Greek mythologies, and blend well. Alysia Helming has successfully brought the reader into the Greek culture with an original and intriguing tale of the Greek gods, who may still be involved with humanity thousands of years after their tales were told. This is the first in a planned series of seven novels. Be prepared: once you read this book, you will be chomping at the bit for the next one, and the one after that. There aren't many books in my DNF list, but the books that are on that list are there for a reason. Unfortunately, this book will have to join the list. 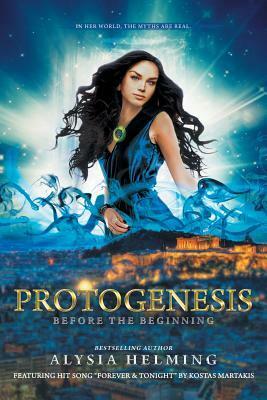 Protogenesis has a very promising synopsis about a young girl who loses her mother and goes on a journey to find her. Instead, what you get is a story about a young girl who loses her mother and goes to Greece to find her, but gets sidetracked by two young men, whom she can't decide who she wants to be with. It seemed like Helene spent more time being in a love triangle than finding her mom. Helene came off as a whiny brat, who didn't treat people very well. The author creates a love triangle that just didn't work for me. Both Nick and Ever were treated poorly by Helene. I understand she is going through something rough... but her rudeness was off-putting and made it hard to have any kind of sympathy for her. The Greek mythology was there, but I don't think it was enough to save this book. The writing was a bit immature, and ironically, didn't take away from anything, but the execution was off. I made it the 62% mark and no longer cared about what happened. I will try to finish this book at a later time, but to get to 62% was a struggle. I couldn’t put it down. I read this in 2 days because it was that good. Alysia Helming creates a fun adventure that would appeal to lovers of realistic adventure, twists, turns and Greek Mythology. Helming creates a lead female character that is believable, smart and likeable. Walking in Helene’s shoes, I felt like her voice was so familiar that I felt a pang of nostalgia. Helming impressed me with her presentation of characters as well. I walked into this adventure expecting a healthy dose of tee I couldn’t put it down. I read this in 2 days because it was that good. Helming impressed me with her presentation of characters as well. I walked into this adventure expecting a healthy dose of teenage angst and was pleasantly surprised how quickly I liked and cared for Helene. Each character who Helene meets is unique with some fun quirks. I literally don’t want to give ANYTHING away because I feel like so much detail contributes to the overall adventure. Brace yourself for love interest conflict that will leave the reader torn (Who does she choose? I know I couldn’t! ), nail biting action, a portal to ____ (sorry, not spoiling!) all before the Spring Dance. Yes! There is a fantastic high school dance scene that trumps all those 80’s Brat Pack dances. Please note that the published edition of Alysia Helming's novel, "Protogenesis: Before the Beginning" paperback will be released in English worldwide online and in book stores by Black Rose Writing Publishers on March 29, 2018, and the eBook will be released on April 5, 2018. The self-published Collector's Edition is no longer available. The paperback and eBook Greek edition will be released on A Please note that the published edition of Alysia Helming's novel, "Protogenesis: Before the Beginning" paperback will be released in English worldwide online and in book stores by Black Rose Writing Publishers on March 29, 2018, and the eBook will be released on April 5, 2018. The self-published Collector's Edition is no longer available. The paperback and eBook Greek edition will be released on April 16, 2018 in bookstores and online by Livanis Publishing. Sign up to receive updates on www.protogenesis.com. Watch the music video at www.foreverandtonight.com for the book's theme song by multi-platinum Greek recording artist, Kostas Martakis, and featuring Principal Dancer with the San Francisco Ballet, Jennifer Stahl. Alysia Helming started writing her own short stories and plays for school in the third grade, and throughout her life has never forgotten her passion for writing. In 2000, Alysia coauthored a pilot for a TV series, “One Degree of Separation” and in 2006, she coordinated the local premiere of the feature-length movie "The Great Warming" starring Alanis Morissette and Keanu Reeves, assisting with the nationwide release of the film. As a former student in Screenwriting at University of California, Los Angeles, Alysia wrote a full-length feature film screenplay, “The Green Warrior”, in 2009-2010. Currently, Alysia is a Producer for a Hollywood TV series under development called "Meet Me in Greece" with Executive Producers Trifecta Entertainment. “Protogenesis” is Alysia’s first novel, which is the first in a seven-novel series. She is enjoying her writing journey, traveling regularly between her home in the Oakland Hills nestled above the San Francisco Bay, and Athens, Greece, the primary setting for her novel series. From 2015-18, she visited Athens, Greece 18+ times. Each trip, she met over 500 friends and collaborators in Greece that helped her to thoroughly understand the rich culture, mythology and unique challenges that the Greek people face through the current crisis there, including Greek music star, Kostas Martakis, who created the theme song "Forever and Tonight" for her book, "Protogenesis". Now, her mission is to help Greece by offering a message of hope and to drive tourism there through her book series. Her ‘journey behind the writing’ is just as interesting as the novel series! It is documented through a series of blogs and a series of short films with Kostas Martakis on her website: www.footstepsinathens.com.